Let kids party on with Disco Kitty and friends by building their own toy bus with the LEGO Movie 2 70828 Pop-Up Party Bus. This fun LEGO Movie 2 party bus features an opening cockpit for the Zebe figure, opening roof and sides for easy play, foldout loudspeakers, a LEGO light brick to light up the rotating dancefloor and a flip-up disco ball with translucent-colored elements. 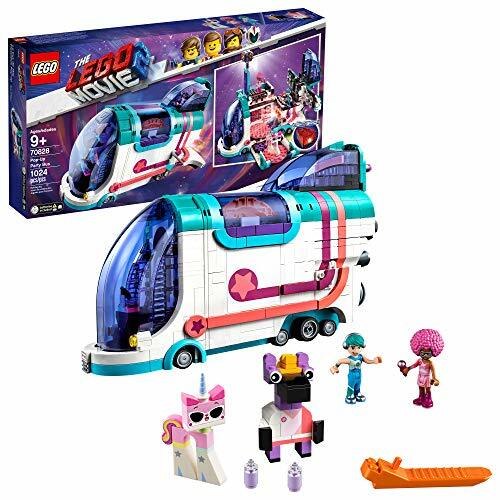 This playset also includes 4 LEGO Movie 2 characters—buildable Disco Kitty as Unikitty and Zebe figures, plus Tempo and Melody mini-doll figures.